Originally posted Feb. 8, 2010. Sarah Little has since moved to the state of Washington. Editor: Sarah Little sent the following originally as a comment to the post that asks if OB should have a town hall meeting. She believes we should, but how she said that, we thought, should be highlighted as a post in and of itself. A couple of years ago my world turned upside down and I landed at the foot of Niagara Avenue in my shiny new truck with my flush-with-cash checkbook, a cheap brown metal cane and a really bad need to throw a never-ending pity party for myself. I came, I saw, I laughed, I stayed. I stayed because of the surfers and the “hippies” and the wandering kids and the nice homeless man in the wheel chair who always smiles at me, even when I’m in a decidedly not in an “OB sort of mood”. I love my adopted community and all the crazy and not-so-crazy people that make it home. I love it in spite of the “element” that disturbs me. Perhaps I love it because of the element that disturbs me. I love it here because one day, feeling decidedly brave and irritated at the same time, I watched a dirty, stinky, loud, aggressive man hitting up all the passers by up for spare change. In a fit of pique I held out my hand and told him I was flat broke and needed money badly, too. He reached into his pocket with a smile and a shrug, pulled out all the change he had, along with a funny wad of greenish lint (lint?) and put it all in my outstretched hand. By all means, let’s have a town hall meeting and see if this amazing community can self-regulate and find creative solutions to the problems of homelessness and vagrancy. Include residents of the high-impact areas, business owners and civil servants. Let’s not forget to invite a couple of the folks who do live “on the streets” of our town. Face it, we’re all here ’cause we like it like this, or sort of like this. I don’t know anyone who wants to “clean up OB”. I think we mostly just want to know we’re doing the best we can for all concerned, including the property owners and the renters and the transient population and especially for those who really cannot stand up for themselves, the mentally ill, the disabled and the children. Sarah- your eloquence about the je ne sais quoi that is Ocean Beach is flat out breathtaking. Keep writing. Seriously. Seriously is the word. Word out. …and I want to know more about the cheap metal cane & about Ross. Anxiously awaiting your reply. Ross- The sorta red-haired fella who cruises up and down Newport Ave….How does one describe Ross? He’s….welll…he’s just “Ross”. Personally..Methinks he needs to get his SAG (Screen Actor’s Guild AKA “Movie Extra”) card. Truly he is one-of a kind, and if you know Ross, you are better off indeed. He will give you a piece of candy, or a hug if you want it. One day Ross bought a comic book for my kid on his birthday. That was $8.00 out of his pocket. Is Ross the dude with the giant pants? Very nice, Sarah. You’ve reminded me of so many of the reasons OB attracted me. Nicely said, Sarah. When I meet you at the Town Hall Meeting I have a big hug waiting for you. Love those who can call em like they see em! wow! please keep writing for the Rag Sarah. Yes, that was really great Sarah. I hope to hear more from you as well. I feel like you really captured a lot of how I feel about OB in so many words. Thank you all for the nice comments. I’m a sucker of positive reinforcement. Annagrace – Do you know who Ross is now? He’s a young man with Down’s Syndrome who you can occaisionally spot catching a ride across “town” on the firetruck, or ducking in and out of the shops on Newport. He’s usually handing out cookies or, as Bill said, a hug if you want one (and deserve one). I’m late (as I am all too often anymore) Sarah, but welcome to the Rag! I hope you will consider writing more for us. Your feelings come through your words in a way that have us all nodding our heads and smiling, something that we all need more of. Hope you’ve recovered since then. I’m trying to get through the other side of a spinal surgery and can commiserate on the physical side (as well as the slim checkbook). Oh, I know Ross! Of course! He’s crazy. In a very good way. Everybody loves Ross. me and my mate came to ocean beach two years ago. before coming here i lived in berkeley for eight years and san francisco for 25 years. i have also lived for short periods of time in paris, berlin, london, amsterdam , and copenhagen. i have traveled to most parts of mexico and central america. i loved all these places but Ocean beach is special. at the age of 60 i am healthy because i ride my bike everywhere and breathe fresh sea air daily. i am more creative in all endeavors, music, writing, craft work. my mate and i have shared almost every setting of the sun since arriving. i have emailed thousands of photos to friends all over the world. as to the current rant, i have been reading the post and sorting out my own feelings and wanting to add my own thoughts . but sometimes someone comes along and sums up and expands those thoughts so poignantly that one steps aside. Sarah speaks for me. she pointed out the one central aspect that cuts to the heart of the matter. 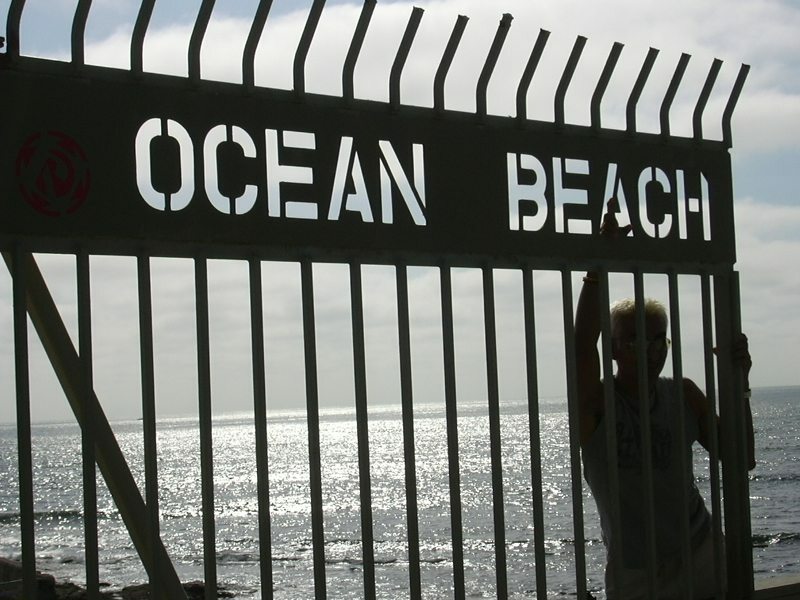 Ocean beach is many things but it is the totality of its parts that make it special. Sarah – you do know there is a Jack in the Box right smack dab in the middle of OB? I’m just curious, but is the dif between Jack & Mac? Any way you swill it, it’s fast food corporate garbage and is a blight on OB, IMO. It’s Jack In The Box #8 which dug into the OB fast food market when Foodmaker was just a pup! I came to OB some ten years ago because I fell in love with Sally. We met, really liked each other and had been seeing each other, regularly.When she aasked me to live with her up on hilly Atascadero Drive, I wondered how that would be for my morning runs. I came to like this place, though. We live up on a hill, overlooking two different views of the water, and love the early morning fog that drifts through the huge shade trees in the front. We have a couple of aged pets buried out at the foot of those pines. We love the afternoon sun that we can bask under in the back yard with its lovely, curved brick walkway. We like the winding streets like nearby La Cresta where we take long, meandering walks. We frequent Ranchos and Natie’s and, occasionally, take company to Thee Bungalow, where the food and wine is great. And we love to walk Sally’s daughter’s dog down at Dog’s Beach. Our little grandson, Marcello, loves to play in the puddles there and to chase after the puppies. It’s a very friendly town, even though sometimes it seems that we are overrun with tourists. Today we visited Tim and Kathy and got to enjoy their beachfront view of sunset at the beach. It is spectacular here. We wouldn’t trade it for anywhere. Lovely John. Articulate, thoughtful and lovely. john – the imagery in your comment is amazing. i can literally see the fog you speak of in my mind….thank you. thatll be the last thing i read before i hit the hay. Frank, thanks for running this again. Sarah, I miss your thoughts on OB & life in general almost every day. Miss chatting over coffee. Love this piece! Oh dear! I was so young and naive(?) when I wrote this. Thanks for the reminder, Frank. My best to you and Patty and the gang. And a big “hello!” from Seattle.